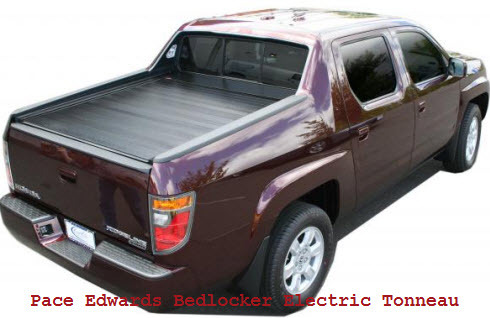 The Pace Edwards Tonneau Cover is a high tech line of tonno covers. 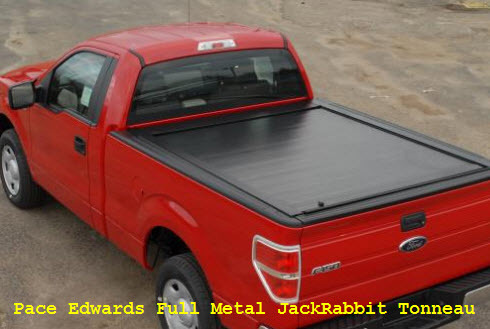 The Pace Edwards Tonneau Cover is a pickup truck bed cover that is known for its technological coolness, smooth operation and low profile aerodynamic design. Pace Edwards implementation of various technologies, like their electric motor driven roll top, make them relatively unique among tonneau cover manufacturers that work primarily in aluminum. The entire Pace Edwards retractable tonneau cover product line consists of 4 different roll top truck bed covers that differ only in their technological gadgetry. All 4 tonno models retract into a canister in the front of the truck bed taking up a small amount of space you don’t normally lose with a soft rollup tonneau cover. But the coolness of a roll top tonneau cover far outweighs the small amount of lost space. The roll top itself is made of aluminum panels, but is not designed to carry a heavy load. The covers all fit over 5th wheel trailer hitches and have no drill, clamp-in installations. Here’s a breakdown cover by cover of the unique features of each member of this product line. Tip: Because these tonneau covers do such a good job of sealing the interior of the truck bed, it's hard for liquids that get into the truck bed to evaporate. This sometimes lead to mold and mildew problems. Universal absorbent truck mats can help resolve this problem. The absorbent mats may also be used in the truck cab on top of existing floor mats to prevent water from getting between the mats and carpeting. Soda pop spills and junk on your shoes can also be absorbed before they stain your expensive truck floor mats.